In 2009, I was determined to go to Gaza. Yes, I had a “person of interest” there, a man who I had met online in 2001 and had corresponded with every day by phone calls, email and video calls. But I had also been doing research for years, and had decided that I was actually going to go. As I asked around about which organization brought delegations to Gaza, I was always given the same answer: Code Pink. I found their website and felt that this was a group with which I could be comfortable. I read about supporting human rights, justice and peace, and I was happy to find them. I had only read about them once before in my local newspaper when referenced by a woman who had recently returned from Gaza. I contacted them, told them I wanted to go and got everything else ready. I knew that this would be a journey of a lifetime. When we met in Cairo, there was a problem with our buses. Apparently no one was willing to drive us to Al Arish. I had no idea what the problem was, but it was explained that because of Egypt’s relationship with Israel, they did not want to allow the transportation of peace activists to the Gaza border. After much discussion, Code Pink leader Medea Benjamin managed to find the group transportation. It was an exciting trip! I had never been to Egypt before (never been out of North America actually), so it was long overdue for me to see a part of the world I had spent so many years learning about. One of our first stops after entering the Gaza Strip was to attend a Meet & Greet with local officials. I was very surprised to find that this meant that we were meeting with Hamas. This didn’t make sense to me. I felt that perhaps this was just a formality to be polite, but the green Hamas caps donned by one of the Code Pink group leaders suggested a warmer relationship. 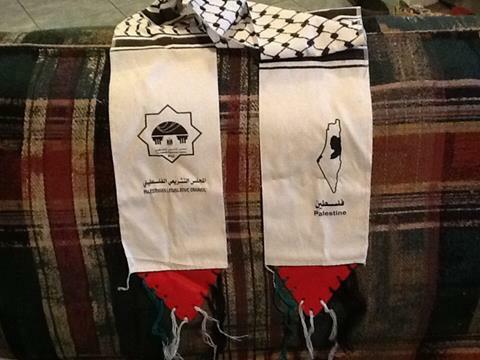 Our welcoming hosts gave us each a souvenir keffiyeh with the official Government of Palestine logo on it. We were also treated to a dinner hosted by UNRWA. It was held at a compound in the southern part of the Gaza Strip. We were treated to music and dancing. Everyone was having a great time. Later, we were advised not to stray from the group and not to travel alone because it was potentially very dangerous. I found this curious. I had always been told what a wonderful place this was, filled with nothing but the most wonderful people on the planet. What danger could there possibly be by being alone? I had talked to others who knew of people who had done the same, and I knew for me, there was no conflict. I wanted to see and understand Gaza, and the fact there was an actual person there waiting for me rather than a guided tour didn’t seem problematic. I had still paid my own way, had made my own arrangements, was an adult, and at no time was told we couldn’t have personal reasons for going. I had a great time there for those three weeks, but I could feel an almost palpable, heavy presence in the air. There was so much destruction left over from Operation Cast Lead. I couldn’t believe that after so long, there was still so much rubble lying around. It was depressing. I was told it was because Israel doesn’t allow building supplies. Fine, but why no clean up? Every question I asked had an answer – and the answers were always about what Israel was withholding. Later, much later, when I saw pictures of the concrete lined tunnels burrowing towards Israel, I couldn’t help but remember those crumbled buildings and wonder if the concrete could have been put to better use. There were Hamas officers on almost every major intersection, and at many smaller intersections too. They scrutinized every passing car, stopping whoever they chose to question. I was always advised not to look at them, so as not to draw attention to us. I thought that was odd. I had heard so much about the oppressive Israeli checkpoints throughout Gaza, and never expected to find similar Hamas installations once Israel had pulled out. I didn’t understand what I was seeing, except in the context of the brutal clash between Hamas and Fatah in the wake of the 2006 election. It was 2009, and Hamas was making sure it exerted its control for everyone to see. This was not what I was expecting. Why were Code Pink so friendly with these oppressors? One thing that had drawn me to Code Pink was their apparent rejection of oppression and war, yet I could see this regime certainly qualified as being oppressive. It concerned me that Gazans still worried as they passed through Hamas checkpoints 3 years after the post election nightmare. I had the opportunity to speak to one young man who had been a driver for Fatah. He was barely in his 20’s. When he drove me past the intersection where he had been abducted by Hamas, he told me his story. He was pulled out of his car, taken to a mosque and tortured for about 15 hours. He was shot in both legs and then left. When he was in the hospital, his mother by his side, 2 members of Hamas came to kill him but his mom made a scene and they finally left him alone. At the time I was there, he still had pain in his legs. It is tragic to me that this Hamas, who obviously oppresses anyone who dares to disagree with them, would find such friendship in Code Pink or other such activists who claim to be struggling for peace. Code Pink brought us on a bus tour of the Gaza Strip. Among the sites we saw, one was the former American International School. It was heartbreaking to see a school that was obviously bombed flat. Not one corner of the massive structure was left intact. We were told that Israel bombed the school out of spite, to discourage Palestinians in every way. It was later that I learned that Israel believed that Hamas was sending rockets from the cover of the school that night. What is the truth? I know it is unwise to question it. We may never actually know but there was never any other possibility presented in our tour except that Israel targeted civilian structures on purpose. As I think back, it would have been more balanced to at least present another possibility. I have to remain hopeful. Unlike those who shamelessly kiss up to Hamas, I do actually want to see a secure and just peace. A Canadian girl with a decidedly unCanadian experience, Linda is a seeker of truth and enlightenment. Formerly married to a Palestinian journalist from Gaza, she lived there and told their story well… until she visited Israel and confirmed her suspicion that she had been exposed to way too much propaganda. As Linda continues to seek truth and enlightenment, she now tells a very different story….one that shows Israel for who she really is – a place of warmth and hospitality….and freedom.